The most action-packed episode of the series ever. Bullets and debris fly all over the place, cars get smashed and explode, Bodie and Doyle move about with their lives heavily depending on it plus we have Leila and the ever reliable, strangely nicknamed Tinkerbell. Charlie is another reliable CI5 back-up man. "To tell the truth, I'm a very dishonest man!" ....which is why I really like this episode. These are the things which attracted me to the series as a youngster when it was first shown, the fights and chases. Sometimes it's good to just have an action-packed, shoot-up instead of a heavy plot which you have to follow carefully. It's got a sense of 'Boys Own' adventure to it, I never tire of watching this one. Absolutely brilliant episode in a very strong production block of stories. I think 1978 was the absolute peak for The Pros for me. There is not a single weak episode in the 13 made in that second block. I agree. They were generally excellent with the right levels of drama, humour and action plus the plots were not as complicated as in later episodes. That's why Brian Clemens was brought back to write Mixed Doubles. The first shootout in Blind Run under the bridge was startling stuff on first viewing and from then on, the pace never lets up. 1. You're freelancers, neither me nor CI5 exist. 2. We give the orders round 'ere Tinkerbell, now just do as we say. This is a great one. However many times I watch it I still can't really understand how a blind run can justify such a high kill count and never really fully understand the story properly I feel - especially as Cowley seems to allow the lads to be so openly put at risk, even when he knows they're totally up against it. Also as a man of principle, it's clear Cowley doesn't like it. Nevertheless - this get top marks from me for action, bullets flying, car chases, Bodie & Doyle scaling walls and being up against it and Bodie cheeky chappy likeability factor. All this with Del Baker and Terry Plummer on heavies duty, silencers, Ladbroke Grove and a drive down Blythe Road Hammersmith - what is there NOT to like in this apart from the patch on Doyle's posterior?! This one had all the hallmarks of a big-budget movie. With a bit more padding to increase the length to 1 hour and 45 minutes, this could have been the first Professionals film and that probably would have allowed more of an explanation as to what was really going on with Cowley helping out those foreign government spooks. Why would he want to help someone considered as an enemy of the UK? Perhaps a favour to an old friend or money? Doesn't seem like Cowley but maybe it might have been his own idea of a training exercise (sort of) to sharpen up Bodie and Doyle and improve their credibility as CI5's top agents (see Wild Justice). Despite all the bullets flying, not that many people were killed. Just that man under the bridge shot by Doyle, Tinkerbell, the man Tinkerbell shot before he was killed, the men killed by Bodie and Doyle on the boat, plus you had Leila and Charlie wounded. Agree with all that dsc, very much film material this one. You're right about the bullets to kill count ratio which was more in line with statistics found on an unlucky day on The A-Team. I'm surprised the boat lasted the distance too tbh! I guess it was to do with the horsepower of the engine. I thought the end was funny when Bodie couldn't remember the lady's number. This one had all the hallmarks of a big-budget movie. With a bit more padding to increase the length to 1 hour and 45 minutes, this could have been the first Professionals film and that probably would have allowed more of an explanation as to what was really going on with Cowley helping out those foreign government spooks. Why would he want to help someone considered as an enemy of the UK? Perhaps a favour to an old friend or money? It would have been good to have this plot expanded by making it a film I agree. Re- helping the foreign spooks, knowing Cowley he was thinking ahead and getting 'one in the bank' for the future. I could see his lending out B and D being used as leverage when he needed a favour somewhere down the line. Yep, good points. Those guys owed him after what he did for them. In a way, this episode showed the rare instance where CI5 were a 'private' outfit, even more of a reason for Bodie and Doyle not to exist. The cars cavalcade is an interesting and action packed sequence. I did wonder from screen grabs who this woman was standing as the cars drove past. I wonder if she ever found out that she made it into 'The Professionals'. It wasn't often that the lads would use false names. They seemed to find their aliases quite funny. Charlie the driver was a new inclusion in the show as an agent. Tinkerbell was an unusual character! Overall I liked this episode. Non-stop action and mayhem in this one. I don't think the series was ever this wild again. A hugely enjoyable episode! It's like a 50 minute preview for action film! Once the excitement starts it barely let's up until the end of the episode. Tinkerbell is a memorable character. I have a minor quibble but it doesn't detract from my enjoyment of the episode. This is one of the times when it seems Doyle and Bodie should be packing more firepower. Couldn't they have stashed an UZI or two under the car seats? As I said its a minor quibble. This episode seems to have made a major impact with detractors of The Professionals. Most of them seem to think every episode was like this. 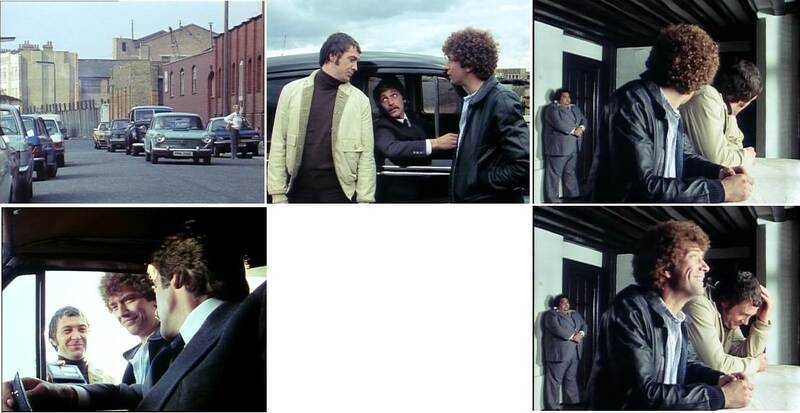 I just remembered that the Top of the Cops segment on Bodie and Doyle uses several clips from this episode. In Operation Susie, they had an FN rifle stashed inside a train at Battersea station. Usually Bodie was the one comfortable with a machine gun as seen in episodes like A Hiding To Nothing, Takeaway and Blood Sports. The boys did manage quite well with just hand guns didn't they? So I will withdraw my minor quibble about this episode. Blooper from this episode at 05m15s in. Doyle having a bit of trouble getting in the van. I watched this again today and picked out a storyline i hadnt noticed before. Without going into too much detail, i think the whole premise was to coax a terrorist out of hiding. The terrorist was the ringleader of the gang that were intent on killing the Middle Eastern visitor under B & D's guard. Both episodes were written by Ranald Graham. I suppose it's only natural to take the same idea from one series to another. That use to happen a lot on old tv shows. Several ITC shows have an episode with the plot of a millionaire's death being hidden from the public so the bad guys can make sure they benefit before the truth is revealed. A cracker of an epiosde. I can remember watching it for the first time on the Video Gems releases well over 20 years ago, which was paired with the excellent Rogue. You don't know what to expect with the lads being sent on a secret mission which they know little about and the way Cowley looks at them then shakes their hands before he leaves looking very solemn, but after this we are in for a treat with a very thrilling episode with lots of twists along the way. Love the location shooting as well. I am sure if I went round that part of London now it would probably be full of apartments for very rich people. I bought it too (green cover I think?) but I had to return mine because it was faulty. Had a fuzzy line on the screen and couldn't get another one. It was the last release before VG went bust. Never realised they went bust. Probably explains why the videos suddenly stopped. Stirring Of Dust and NAVCCS was scheduled but never released. I enjoyed hunting them down over 95-96. Still got them in the loft. I kinda like this episode, not sure why though. The story of escorting this "enemy of Britain's allies" seems a bit peculiar. Rescued by the boys humour and some good action. Bodie forgetting Phillipas telephone number, while Doyle gets off with Leila. Cowley: "You knew about the ISS deal with the CPI... I'd rather have been up against BOSS, even the KGB"
Cowley: "I'd rather have been up against MFI, even KFC" Then you see him biting into a chicken wrap. Tinkerbell is the (almost) silent hero of the episode. "If the shoes don't fit, change the pony"
I think maybe in this episode, CI5 were acting as a private security agency, luring out a gang of hitmen in order to protect an enemy of the UK. Perhaps Cowley got paid a very handsome fee. Perhaps Cowley got paid a very handsome fee. Can't see Cowley risking his top men on an operation for a backhander. As i posted before, i think Cowley saw it as one in the bank, a favour which he could call in sometime in the future. COme on DSC, Cowley wouldn't have done this type of thing for money, maybe a truckload of pure malt scotch though. Regardless of whether Cowley would or would not have done a certain thing/responsibility, it follows Clemens orginal ideas back in the early 60s. They are a bit off the wall - great fun nonetheless.